Google released it’s Google Podcasts app on the Google Play Store a couple of months back in June 19, 2018. It’s a very handy tool to listen to your podcasts on your phone and discover new ones. Google also released developer guidelines for developers to make their podcasts compatible with Google Podcasts app. So I am gonna just guide you on how to add your podcast based on the guideline. First things first, you will need a platform to publish your podcasts. You could use any platform which can host audio files to start your podcast. But the easiest option I would suggest is to use WordPress. It’s easy to use and you can easily setup your podcasts using free plugins. You can either choose to start your podcast blog on wordpress.com or host your own from wordpress.org. WordPress.com provides 3GB of free storage and comes with podcasting feature. No extra plugins required. Only downside is that you won’t be able to customize the look or any other features as your need and for the free version your site name would be on wordpress.com domain (for e.g. yourname.wordpress.com). You can choose to link your own domain to wordpress.com as well. But if you choose to host your own site with WordPress, you will have full control of your site. You will have to get a domain for yourself and some decent hosting space. Then you can customize the look and feel of the site as per your will. You will get to choose from millions of themes available online or create your own if you please. Now we come to the podcasting part. There are several free plugins available for podcasting. Some popular ones are Seriously Simple Podcasting, PowerPress Podcasting plugin by Blubrry, Podlove Podcast Publisher. All these and other plugins do their work but my personal favorite is Seriously Simple Podcasting for it’s serious simplicity. It’s very simple and does what it needs to do best. It creates a new post type called “Podcasts” which you can access from the side menu and start publishing podcasts normally the way you post blogs. It then creates a nice player with description of the podcast for you. If all goes well your podcast is now ready to be played on Google Podcasts. If you have any queries please feel free to leave your queries on the comment section. I will definitely try my best to answer your queries. 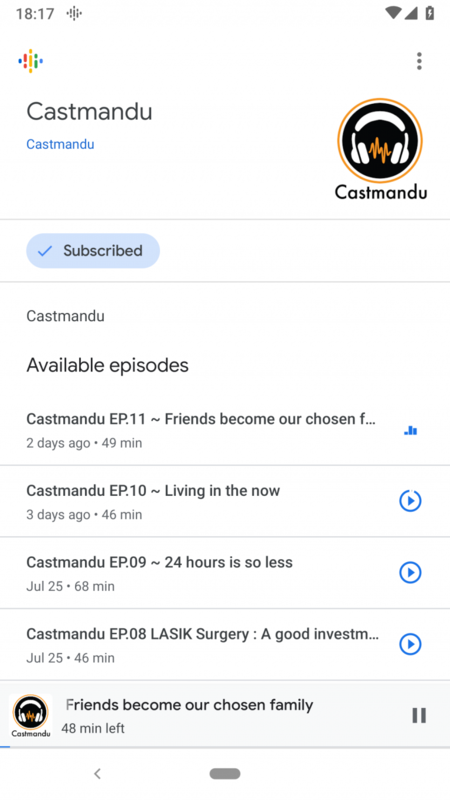 And please listen to Castmandu on Google Podcasts. My first attempt on creating a documentary. Kudos to the team at ISARD for their great effort in addressing the water crisis, specially the Women of Dhuskun. Thanks to all the people who made this documentary possible. Bivas Neupane and Akriti Shilpakar for the words. Geeta Neupane for the beautiful voice in narration. Kishor Maharjan for the wonderful videography. He was still confused whether he should call her or not. “What are you talking about? If we stay with you, it would be a normal meeting. It wouldn’t be a date.” Alok gestured his hands to display quotation marks as he told the word date. Suman liked to call today’s meeting with Alisha, their first date. He took out his cell phone and opened the Phonebook in his cell which displayed Alisha’s number. He then started playing with his mobile set. “Shall I call her for you?” Kushal yelled at Suman. Suman liked Kushal’s idea. He then moved slightly away from his friends and pressed the green button on his mobile. His heart was pounding with nervousness. “Hello”, a beautiful sound came through the speaker of his mobile and reached his ears. He was about to ask her to come to Mangal Bazar and she was already on her way to Mangal Bazar. Suman thought if his heart’s voice already reached her heart. Alok and Kushal sprung out to him immediately as he hung up the phone and asked what had happened. Suman was explaining his conversation when Kushal spotted Alisha far away coming towards them. Kushal was always the one who spotted people before anyone else. Suman wondered how Kushal could recognize Alisha in such darkness. Kushal and Alok then ran away of sight. Suman watched Alisha approaching him with a smile on her face. He too smiled at her and went towards her. “So where are you going?” Suman started the conversation. He opened his back to take out the novel and handed it to Alisha. “Pilgrims?” she wondered what it was. She nodded her head denying to recognize the book store. He really wanted to say no but the word “Ok” slipped off his mouth. She left off to her friend’s home and he started dialing Kushal’s number. After Suman’s so called “Date”, the second “Date” took quite some time. Not just quite some time, it took exactly 23 days. Suman was keeping a good count of the days. He used to meet her online but couldn’t ask her out. He couldn’t think of any reasons to ask her out except for her to return the book. And asking to return the book would be so rude. I’m pretty sure that a random bumping into each other is not called a date, but not for Suman. Suman would count it as a date. So ya, Suman’s second date was that kind of a date. And guess where it was? At a bank. Suman was assigned the job of depositing a cheque by his brother. He was so unwilling and he had to drag himself to the bank. And to add it on top. The queue was super long. He was ordered to complete the job today itself at any cost; so there was no way backing off. He hesitantly stayed on the queue silently cursing his brother, cursing the bank for the long queue and cursing everything. Thank god, the line was moving in a descent rate to calm down Suman’s irritation by a bit. Despite the movement, the length of the queue remained pretty much constant with people adding up in the same rate. He was checking the line and calculating on his mind the rough time that he would have to stay on the line. He then turned around to check how much had he moved since he got in there and that was the moment when his second “date” was about to start. On turning around, he saw Alisha on the queue some 5 persons behind from him. His heart was throbbing with nervousness. He wasn’t sure what he should do next. He couldn’t decide his next steps. As he kept thinking, the line was moving forward. Damn, he wished the line would stall for some moment. He quickly decided and turned around to call her. “So what brought you here?”, asked Suman. “College fees. Today is the last day.”, Alisha whispered. Ohh, so this long queue must have been because of the last day, Suman thought. He was like 5 persons far from Alisha so he couldn’t talk much. He kept wondering what to do next. He wanted to call her on the front at his place. But he was sure the people behind him would be furious about it. The line was moving forward and he was approaching the counter. For the first time, he was wishing the line moved slower. An idea then struck his mind and he moved out of the queue and joined Alisha. This way he could talk to her and buy himself some more time. He approached her and both of them smiled. Both of them giggled softly. And then came the awkward silence. Both of them didn’t know what to talk about or where to start from. He wished Alok was there to tell him what to talk about next. He was completely clueless and the queue was moving forward so fast or maybe it seemed fast for Suman only. Okay, so he thought maybe talk about the queue. He didn’t know if it was the right topic he should be choosing but something is definitely better than nothing so he opted for it. “And how’s your classes going on? The exams are near, right?”, Suman continued the conversation. “Ya, exams and then a month long vacation for Dashain till Chhath.”, Suman expressed with a happy face. People from behind then shouted at Suman. It was his turn to move to the counter and he hadn’t realized it. He moved forward deposited the cheque and after it was done smiled back at Alisha and pointed towards the door gesturing that he would be waiting for her there. Suman smiles in approval. “Ya, we just love to sit there and chill. You are welcome to join us any time.” He was glad that he said that in the flow. Damn, Suman curses himself. The fate was taking him in the same direction and he changed the direction himself. He now wished he had said he was heading towards home. He could have walked certain distance with her. Now he couldn’t back off. He bid her goodbye. She left and he walked towards Mangal Bazaar dialing Alok’s number on his phone. He couldn’t wait to tell the guys about his second “date”. After parting with Alisha from the bank, Suman called Alok and asked him to come to Mangal Bazaar right away. Suman was pretty sure that Kushal would be there with Alok and yes he was right. They would always be busy playing video games in Alok’s PlayStation which Suman had least interest in. When Suman reached Mangal Bazaar, the duo was already there anxiously waiting for him. Alok had sensed the excitement in Suman’s voice and he couldn’t wait to listen to what Suman had in for them. Suman then explained his second “date” in full detail quoting each and every sentence as is. Alok was completely tuned into Suman’s story. He was always excited about Suman’s love life. And always pushed Suman to make the move. He loved to be the “Love Guru” and in fact he was pretty good at it as well. Kushal laughed at Alok’s speech and Suman kept on listening to Alok with all smiles. “Theory?” Kushal and Suman shouted at once. Kushal and Suman stood there. Both totally clueless. After a momentary pause, Alok announces, “There is no such thing as third date. It’s what I love to call, the ‘Bhet’.” He stands there proud as if he were a leader and his followers were applauding but his followers were bursting out laughing. It was indeed pretty genius. When you are dating someone for so long, it would just be a normal and more importantly: a comfortable “bhet”. But sadly, Suman never got to enjoy those comfortable “bhet”s. Despite millions of persuasions from Alok, Suman denied to call Alisha. He insisted that if she were interested in him she would be calling back. She would have to call him to return his book and Suman was waiting for her to finish the book and call him. But that never happened. Whether she abandoned the book in some dusty corner of her room or she gave it to someone else, Suman never found out and just hoped that she hadn’t completely forgotten about him and would call him someday. Alok too was fed up of pushing Suman to make the move. Maybe that’s what destiny is. If it’s not meant to happen it will never. After Alisha, Suman had given up in love. He thought that love would never happen to him. Maybe it’s not what god had written for him. And he would not even try again. He was happy the way he was then. He enjoyed life. He enjoyed good times with his friends Alok and Kushal who were always there for him and he believed that they wouldn’t part until death. Friendship is indeed worth a lot more than love. Now leaving the story of friendship behind, let’s continue with the story of love. Mangal Bazaar, the gang’s second home, was having a celebration and you can’t imagine them not being a part of it. A week long festival was organised to celebrate New Year and the festivity was sprinkled all over Patan. “Yala Mahotsav 2069” was what the festival named. Suman, Kushal and Alok all three were job holders and sadly at three different companies. They would all gather up after work and enjoy the festivity. On the third day, Suman had some extra work at office. He was cursing his boss for making him work late. He couldn’t wait to complete his work and jump off to Mangal Bazzar to devour all those newari delicacies to calm down his tummy after long day at work. He could already see himself enjoying all those newari cuisines, mo:mo: cha, choela, and his favourites tee:shyo and jibro. His thoughts were then interrupted by a phone call. He checked his phone. It was Alok. After completing his work, Suman went home and straight to the kitchen. He was drinking his tea when his phone rang again. He looked up his phone but he hadn’t had it saved. He received the call. The voice on the other end was a sweet one. A girl’s voice. Suman thought that it must be some computer institute trying to advertise their courses. Suman was relieved that it wasn’t an advertisement call. Suman’s thought Neha was just going along with the prank. “Okay okay. I’m coming.” Suman was pretty sure this was Kushal’s plan. He gets ready immediately and leaves. Upon reaching Mangal Bazaar, he called Neha. He didn’t call Kushal or Alok just to let them feel that their prank was working. He then went to where Neha was, expecting to see Kushal and Alok there but they weren’t there. Maybe they were hiding somewhere. Going along the flow he starts casual conversation with Neha. Suman and Neha walked to Tyagal from Mangal Bazaar, talking about the Newari culture which happened to be both of theirs topic of interest. They walked through all the alleys enjoying the exhibits admiring each and every one of them. Neha was really enjoying the exhibition and Suman was enjoying it as well but moreover he was enjoying the company. They were totally enjoying the exhibition and didn’t realize the time pass by until Neha’s phone rang. It was already half past eight and her dad had called her. They walked back to Mangal Bazaar and he dropped her home agreeing to meet tomorrow at the festival. Later that night, Suman uploaded the pictures that he had taken earlier. Neha started commenting on them and the comments got long with their conversation. They spent hours chatting. The next day Suman couldn’t wait for the time to pass so he could enjoy one more great evening with Neha. After that day during the festival, Neha got closer to the gang. Neha hanged out with the guys at Mangal Bazaar and they all enjoyed it. They would meet almost every evening after all of them returned from work. One fine day, Suman was working at his office when his mobile beeped with a message. It was Neha’s message on facebook. Suman worked on the invitation design with all the enthusiasm. He put in his best on it. After all he wanted to impress Neha with his talent. He finished it and showed it to Neha and she did get impressed. Neha proposed to meet at Cafe du Temple after work for the treat. And Suman happily agreed to it. Suman rushed out of office that day. He was super excited. He couldn’t wait to see Neha. It would be his very first date that could actually be called a “date”. They reached at the restaurant and ordered coffee and Suman ordered a plate of chowmein. He was starving as he had an early lunch that day. The conversation started with discussing the event. Neha described all the details about the event, her involvement in it. She talked about her office and everything. She kept on going. And Suman kept on listening. He enjoyed listening to her talk. After all the talking, they went for a stroll around Mangal Bazaar and returned back home. That was how Suman’s real “First Date” went. It was indeed a really special day in Suman’s life. And after that day, Suman and Neha got closer. They talked every evening. Phone calls started getting regular and facebook messages ever so frequent. That day was the start of their story. Sorry, there seemed to be a problem in the tutorial described before. 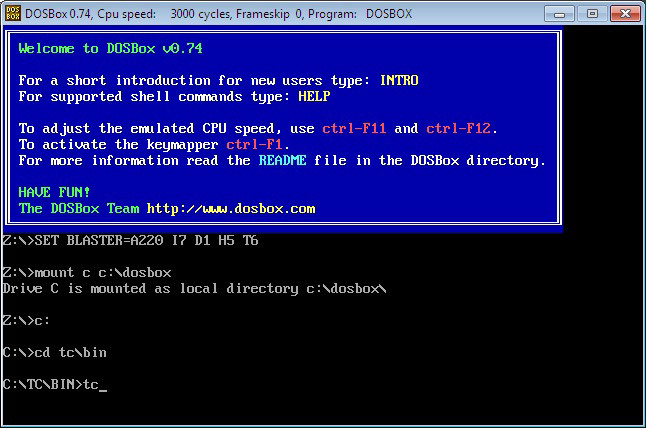 There was a problem loading the includes file in turbo c which was due to directory mismatch in the turbo c installation.keeping the tc folder in a folder with name dosbox and mounting the folder dosbox as c: would fix the issue.The tutorial has been updated to fix the issue. Today I noticed that Win7 doesn’t support Turbo C graphics. 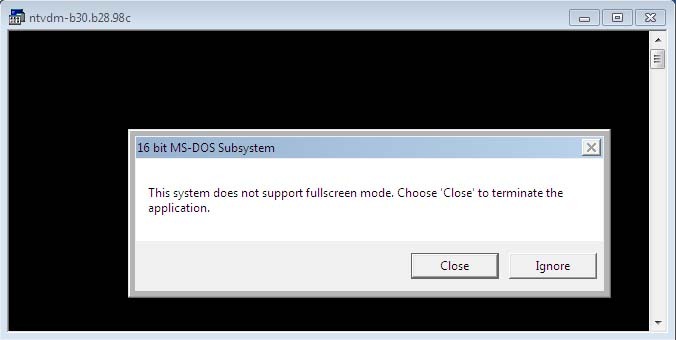 Win7 doesn’t support the fullscreen mode for DOS applications. So the solution to this problem would be to install DOSBox on your win7. With DOSBox you can run turbo C on fullscreen mode as well. So download the latest DOSBox and start using Turbo C on fullscreen. You need to first mount the folder containing turbo c to be able to run it. P.S. if you use ‘gcc’ and want to be able to use graphics.h, you will need the library ‘libgraph’ installed. This post describes very well how to do it. 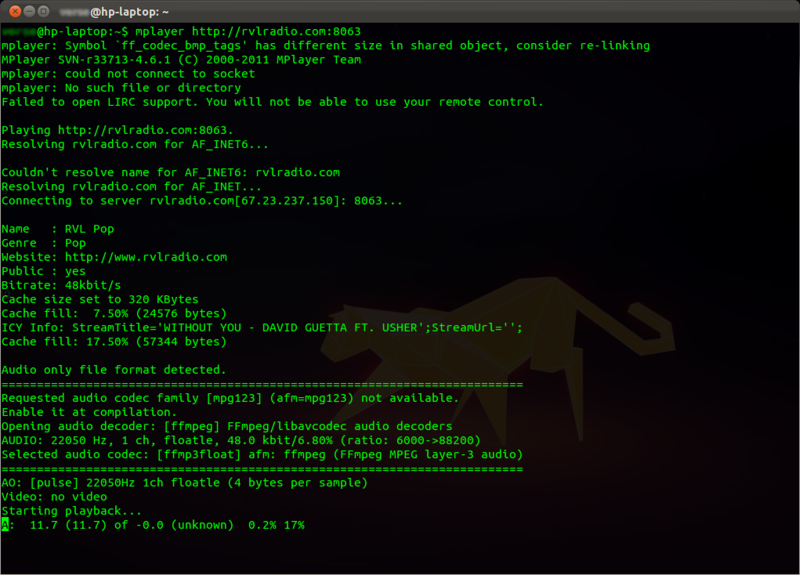 If you are on linux and don’t want to trouble your browser to listen to the radio, then here’s how you can achieve it. The aforementioned example is for the live radio. You just need to change the port to tune into other channels under rvlradio. Below is the list of URIs for different channels. Here’s a screenshot of the RVL Pop channel [Without You – David Guetta feat. Usher] being played on my machine. CHEERS to Revoultion Radio !!!!!! Thanks to my dear friend Sachit for providing the slides. Chinglish is a portmanteau of the words Chinese & English and refers to either spoken or written English which is influenced by Chinese. Chinglish, which is sometimes called “Chinese English” or “China English”, is the combination of Chinese grammar & English vocabulary. The origin of Chinglish can be dated back to the mid 17th century when British traders arrived in Southern China. The British and Chinese traders, due to the communication gap, used Chinese pidgin English for their business. Although, later standard English was begun to be taught in China’s education system, Chinese pidgin English couldn’t be eradicated and evolved to take the form of what is now popularly known as Chinglish. So, what’s the reason behind the existence of Chinglish? The main reason is found to be complexity. Chinese is a very complex language. In fact, it is considered the most complex language of all. So exact & accurate translation of Chinese is a really difficult task. 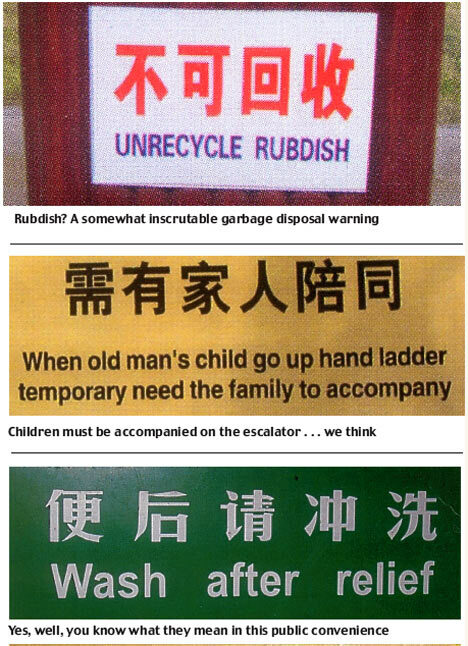 Here’s an example for how difficult Chinese translation can get. Let’s analyze the figures here. The Chinese sentence has 4 words and the English translation has 37 words. It’s nearly in the ratio of 1:9.If we count the syllables, the Chinese sentence is 4 syllabled while the English translation is composed of 52 syllables. Thats 1:13. Shocking! right?This shows the complexity of Chinese language and how can we expect ordinary people to make these sorts of translation. This leads to mistakes in translation giving rise to Chinglish. Confusion is created in translation due to different connotations for same denotation. 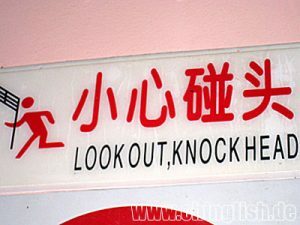 Verbs like see, watch, read and look have the same word ‘kan’ in Chinese. So “I’m watching a movie” is incorrectly translated as “I’m looking a movie”. Similarly, “Turn on the door” for “Open the door” and “Can you say Spanish” for “Can you speak Spanish”. 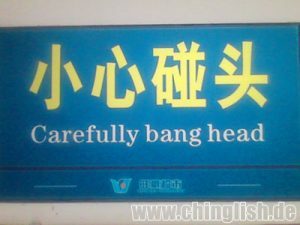 Another reason behind the existence of Chinglish is quite interesting. The reason is ‘humor’.The young generation, though realizing the mistakes, find Chinglish interesting and humorous. So they continue using it. They select vocabularies to rhyme their phrase rather than the proper usage. The linguists say the birth of Chinglish is due to “psychological structure latent in the brain” which Is activated when one attempts to learn a second language. There are several other examples of inter-language like Franglais for French English, Hinglish for Hindi English, Spanglish for Spanish English and many more.